NES Shadowgate (USA) in 04:17.09 by DrD2k9, Zekna & Randil. 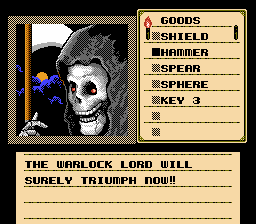 Shadowgate is a storybook game in which you wake up in front of a big castle and must make your way through it solving a variety of puzzles. This run created by DrD2k9, Zekna & Randil is an improvement of 23 frames over the previous run of the game.